I am a wife and mother of 2 awesome kids! I have my masters in Marriage and Family Therapy and a business where I do consults for families with children called JumpStart Parenting. I love staying home with my kids but also enjoy working with families and helping them find solutions to make their lives happier! I also LOVE to cook and feed my family meals that are healthy and free of additives and preservatives. I make real food with real ingredients, I am a crazy label reader. My motto is, 'if I can't pronounce it, or buy it for my kitchen then I'm not feeding it to my family'. I like to create yummy meals and enjoy the challenge of making them healthier and lighter. This is my blog about what's cookin' at my house! I adapted this recipe from the Whole 30 recipe book. I am obsessed with my new Spiralizer! We are making noodles out of all kinds of vegetables! Spiralize a large zucchini and put in a bowl. Add a few spoonfuls of the pesto to the "zoodles" and stir to combine, add more pesto to suit your tastes. Toss in grape tomatoes and serve. Options would be to top this with Parmesan cheese, grilled chicken, steak or fish. Enjoy! I'm sure anyone who used to follow this blog is certain that I had fallen off the face of the recipe earth! I have been so busy with yoga and my kids that getting dinner on the table has been quite the challenge. I have created several new recipes however getting the pictures and writing down the details have been another story. Mix all ingredients together in a bowl and gently stir. Enjoy! I saw this recipe in the new Cooking Light magazine. I tried it today and it was so good! Of course I didn't follow the directions exactly but what I did worked great, so below is my version. Into the crock pot add the vinegar, onion powder, garlic powder, paprika, peppers with juice, salt and pepper and turn to low. Heat a skillet and add the olive oil. Season the meat with salt and pepper and light sprinkle with onion power. When the oil is hot add the meat, sear both sides about 4-5 min per side, until a nice crust forms. Add the meat to the crock pot and cover. Cook on low for 7-8 hours. When the meat is fork tender the meat is done. This the vinegar, pepper and spices waiting for the yummy seared beef. Seared beef ready to be slow cooked. I served this two ways. For my husband and kids I bought small dinner rolls (the one from the Publix Bakery) we put mayo on them then the meat, a slice of provolone cheese, topped with banana peppers and they were delicious! The tangy sauce left over from the meat was delicious to dip in, it reminded me of a french dip sauce but with so much flavor! We had it with fresh veggies and sweet potato fries. I ate the shredded meat over a large green salad, topped with tomatoes, cucumbers, banana peppers and drizzled the tangy sauce on top. It was so good I had to post it tonight! Hope you all enjoy this as much as we did! I wasn't planning to blog this, (which is why I only have 1 picture, but this was too good and simple not to share) I am always nervous about making a stir fry because I think the meat is usually tough. Today I went to Publix and ask the butcher for a piece of grass-fed "greenwise" organic beef sirloin. I brought the meat home and sliced it in half-lengthwise then cut the meat against the grain into very thin slices. This was key to very tender beef in the stir fry tonight! It has taken many times but I am sure this helps, when the meat slices are too large they are just tough and chewy which don't make for good eats. Whisk 3 T of soy sauce and 1 t of cornstarch in a large bowl, add sliced beef and gently toss to combine. Whisk the ingredients for the sauce together and set aside. Heat a wok to high, add the canola oil once hot, add beef, discard marinade. Cook beef for 3-4 minutes then remove from heat and set aside. To the hot wok add the broccoli, carrots, onions, and garlic and stir fry for 3-4 minutes, adding the sauce in the last minute. Finally add the beef back to the wok stir to combine. Lightly drizzle honey over the top. Serve over brown rice. I have been very absent for a while now and I apologize. Between the yoga studio and kids and sports I am hardly cooking! Oh and the fact that we got the Big Green Egg and now my hubby is making all kinds of yummies for us! I will get back on it this winter for sure! Anyhow this is totally a stolen recipe, from Trader Joes, I was in there a couple weeks ago and they were sampling this and it was way too good and easy not share! Mix all together and serve! Wow that was hard right??? *If you don't have a Trader Joe's near you, you can cut up the veggies your self it includes, red cabbage, green cabbage, jicama, broccoli,green bell pepper, radish, carrots and celery. WW Friends: This dish serves 6 and each serving has 4 points! It is so crunchy and delicious! 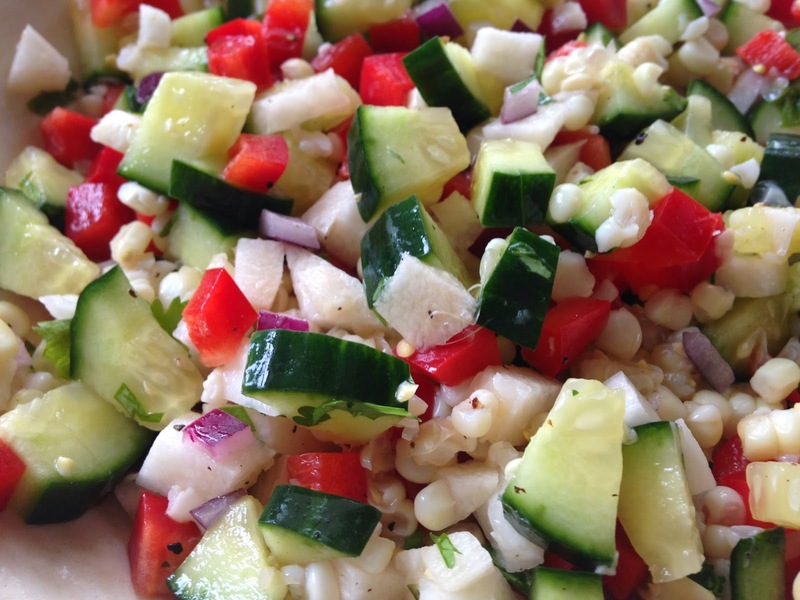 This is a simple summer salad that is super delicious and super easy. I love making it on a Monday and snacking on it all week! Mix all ingredients in a serving dish and refrigerate for 1 hour. So easy and so delicious! I have been a bad bad blogger lately. I have been so busy with kids, yoga, summer, swim team, house renovations... honestly the list goes on and on! The other big thing that has had me cooking less is I gave my husband a Big Green Egg for Father's Day this year and he has been making some great stuff which has really reduced my time in the kitchen. I must admit it has been quite nice. Don't get me wrong, I love to cook but it is really nice to share the job sometimes! My summer veggies from my garden are great this year! I have so many grape tomatoes that I am going to be eating them for a while and I need lots of recipes to use them up. Today, as I was thinking about a recipe to use these tomatoes, I remembered that we used to eat at this restaurant at North Point Mall years ago and I think it was called Mick's but I'm not completely sure about that. It was on the bottom level near the parking deck as you enter the mall. They had a dish called Corn and Tomato Linguine that was out of this world! My mom and I used to make it all the time. Even though I don't eat pasta anymore I still think about this dish. It is garlicky and flavorful and oh so good! So I decided to put my own twist on the corn and tomato linguine without the pasta today and this is what I came up with...it was pretty good! Heat a nonstick skillet over high heat. Add 1 T olive oil and 1 T butter. Once they begin to bubble add your shrimp season with salt and pepper and a few shakes of paprika. Saute until the shrimp is cooked through. Remove shrimp and set on plate. Add remaining butter and olive oil then add onion, shallots and garlic. Saute for 3-5 minutes or until the onion is translucent. Next turn the heat to high and add the chicken stock and bring to boil then reduce the heat and simmer for 4 minutes. Next, add the corn, combine well then add the tomatoes, cook for 1-2 minutes then add the shrimp back to the dish. Finally, add the parsley stir to combine then remove from pan and serve. Taste for flavor, you may need to add more salt here. Then top with fresh grated Parmesan and serve hot. And prepped our local shrimp. Ready for the shrimp, parsley and parmesan. My hubby is stealing a bite as I am taking pics! This a a great dinner or lunch salad. I made it a few weeks ago and it was too good not to share. Nothing crazy out of the ordinary just really good! I use the dressing from Trader Joe's and usually mix it with a little soy sauce because it's a little too sweet for me. Enjoy! Marinate the chicken in a bag with the Asian Vinaigrette for at least 30 minutes but could be as long as 8 hours. I use one from Trader Joe's that I like. Arrange the lettuce and vegetables in a large salad bowl, lettuce, cabbage, bell pepper, edamame, cucumbers and top with onion slices. Grill or saute the chicken then slice and add to the top of the salad. Toss with 4 tablespoons of dressing then top with crunchy Chinese noodles. Weight Watcher Friends: This salad serves 4 and has 5 Points Plus before you add the dressing.